The 612 is the prancing horse's strong, silent type; it's about as edgy as a long weekend in the South of France, and just as pricey. That's been the extent of criticism leveled at Ferrari's luxurious tourer. 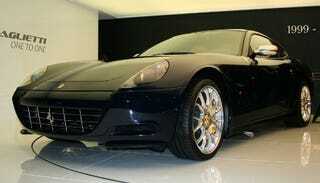 With the 2009 edition, the company left most aspects of the 612 alone, but added a couple of quick updates. They won't likely alter that 612's nondescript feel, but is may make the experience of driving one more Ferrari-like by increment. Like the current model, the 2009 612 is powered by a 5.7-liter V12 producing 532 horsepower and 434 lb-ft of torque. New for next year include updated "Manettino" switch. That's the finagler of the 612's driving dynamics, by way of pre-set combinations of transmission, power output and traction control settings ("Ice," "Low Grip," "Sport," "Race," and "Off). It also gets a modified F1 semiautomatic gearbox, which the company says will provide faster upshifts and those luscious throttle blips for rev matching on downshifts. Those updates won't make a 612 into Mr. Hyde, but then again the 612 isn't the 599GTB.